We now know Gore’s errors are based on the global warming fraud orchestrated by a few scientists centered round Phil Jones, Director of the CRU. Emails between those climate scientists, identified by Professor Wegman as publishing together and peer reviewing each other’s work disclose the complete manipulation of climate science and the Reports of the Intergovernmental Panel on Climate Change(IPCC). Bishop Hill provides a useful summation of some of the outrageous comments and actions. What is missing is the nasty vindictive tone that permeates almost every item. What are the mainstream media going to do? How can they ignore the biggest scandal in science history and then claim any credibility? We already have a strong indication because they either don’t cover it or claim, like Andrew Revkin of the New York Times, there is nothing of consequence. No surprise because he was in direct communication with the CRU gang. Other left wing outlets have similar reports such as the Guardian in England and Harrabin at the BBC. Delingpole at the Telegraph identifies some vapid responses. Gore appears on TV or radio programs, but with tight terms of engagement. He appears alone, will not debate and likely defines the pattern of questions. He has no qualifications in the subject, has never published any peer reviewed papers, yet is given total credibility. Indeed, he is not even asked about it. He has produced material on climate with multiple errors but made no attempt to correct them. He attacks with slurs and invective anyone who dares to question his claims or the errors. Who are the flat-earthers now? He is never asked about the money he has made exploiting the errors. He is never asked about funding, affiliations or sponsors. He is never asked about his unjustified condemnation of the lifestyle of citizens while his is more profligate than theirs (carbon footprint). When asked it is usually done to allow him to gloss over the facts. Despite this he obtains invitations to high-rated mainstream programs and is treated with deference and fawning attention by supposedly unbiased hard questioning media. He’s allowed to puff, preen and pontificate from a position of moral superiority. His recent appearance on Larry King’s program is a perfect example of unjustified pandering and lousy journalism. Interviews are carefully selected to reduce any chance that he face people who know and understand the science. It’s easily controlled on radio or television, but meetings are a bigger problem. Keynote speeches are relatively easy because it’s normal to have no questions. Some groups are supposedly friendly and expect questions. Such was the case when Gore spoke to a recent meeting of Environmental Journalists. He expected only favorable questions. At the meeting Phelim McAleer, an independent documentary producer, confronted Gore about inaccuracies in “An Inconvenient Truth.” Gore dodged the question and McAleer’s microphone was disconnected when he pressed for an answer. People with views opposing Gore’s are rigidly held to the truth, required to produce accurate facts and are quickly attacked for even the slightest error. Martin Durkin’s documentary, The Great Global Warming Swindle had one small error in the first release. It was immediately and viciously attacked. Durkin withheld the DVD version until that was corrected. Gore’s errors are still uncorrected and he is still training apostles to show the movie and push his false message. Opponents are rarely invited to mainstream media programs. When they are invited, their qualifications are immediately questioned. The nature of their participation in climate and publications are challenged. They’re asked about errors they’ve reportedly made or been accused of making. Funding and income are prime targets. Guilt by association with individuals and groups are targeted. Why isn’t Gore challenged in a similar fashion? Have people confused the person with the office? He’s no longer Vice President or a politician, yet he seems to get the privileges of the former and allowed laxity with the truth of the latter. He was given a free pass when he appeared before the Senate and Congress. He asked for an unprecedented 30 minutes and then violated the rules completely by submitting his testimony just 1 minute before his House appearance and a few hours before the Senate hearing instead of the required 48 hours. It’s time he was forced to answer questions. He is a private citizen and should be treated in the same way by the mainstream media. A court case would confront him with questions on which he cannot prevaricate. He’d probably decline to answer, but then he is exposed. A fraud charge is probably the best because he is acknowledged through his Oscar and Nobel Prize as the most renowned messenger of the scientific falsehoods. He, more than anyone, has perpetuated the myth that CO2 is causing climate change and falsely labeled it a pollutant. He was involved in a meeting at the White House in 1998 with Bill Clinton, Lord Brown of BP and Ken Lay of Enron, apparently laid out the strategy for carbon credits. He then, by all accounts, has profited as much as anyone from the carbon credit market. 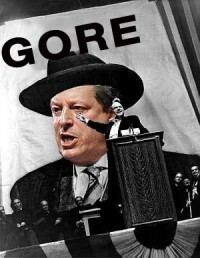 Mr. Gore quotes the Bible, he should consider a public view of his actions in light of the following; “Beware of the false prophets, who come to you in sheep’s clothing, but inwardly they are ravenous wolves.” Matthew 7:15 (American Standard Bible).